I was hoping for my first review to be of a local place rather than a big chain, but I was in the area of Johnny Rockets and figured, why not? 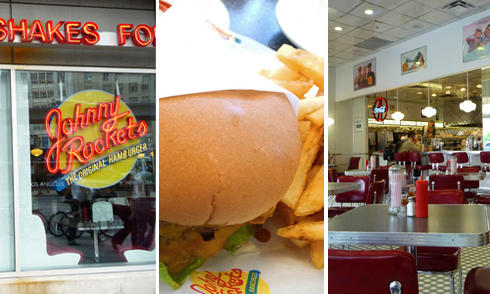 Johnny Rockets is a fairly large chain, with over two-hundred locations all over the world, so it’s easy enough to assume that it’s going to be mediocre. My last Johnny Rockets experience was several years ago at their Niagara Falls location, and my memory was that it was decent enough, so I went in with an open mind. The first thing you notice is the kitchy, 1950s Americana decor, complete with a jukebox playing ’50s pop. The place was fairly empty when my dining companion and I showed up, and we were instructed to seat ourselves. The service was a bit leisurely, but generally fine. The menu is mostly burgers. They have some other stuff on there, but it’s fairly obvious what their specialty is. I ordered the Rocket Double, which the menu describes as having “Cheddar cheese, iceberg lettuce, fresh tomato, onion & special sauce.” I opted to go onion-free, as I’m generally not a huge fan of raw onions (I know, burger sacrilege! But I’m just not crazy about them. I find that they have the tendency to be overpowering, and they linger on the palette long after they have worn out their welcome). The burger came partially wrapped in paper, a nice touch and reminiscent of great American burger chains like In-N-Out. One bite and it was clear that this was a real hamburger: fresh ground beef, no crap mixed in. Good times. The patty has a good texture to it — it’s loosely formed, and has been cooked on a griddle, giving it a bit of a crust (the crust could have been a bit more pronounced, but it was decent enough). The burger was cooked to well done, but was nicely juicy. It wasn’t the most flavourful beef ever, but it definitely had a somewhat beefy flavour. All in all, not a mind-blowing burger — but just by virtue of being non-frozen, juicy, and without random stuff mixed in, it’s head-and-shoulders above many Toronto burger joints (which is kind of a sad indictment on the local burger scene). As for the other components of the burger: the mild cheddar cheese was completely melted, which I certainly appreciated (there’s nothing worse than getting a so-called cheeseburger with a cold, unmelted slice of cheese). The “special sauce” was barely noticeable, the lettuce and tomato were fine, and the bun was nice and soft and complimented the burger quite well. The sides were pretty underwhelming. The fries were pale, dry, and kind of tasteless. It probably didn’t help that they hadn’t been salted at all. They basically tasted like frozen fries that had been prepared poorly. The onion rings tasted like they might have been okay at some point, but it was clear that they had been sitting out for a while. I also tried the patty melt, which I thought was pretty tasty, though my dining companion wasn’t quite as convinced (it tasted very strongly of caraway seeds, a flavour he’s not keen on but that I enjoy).